Provenance: Early 1990’s, The Merrin Gallery, Inc.
Of all the hallmarks of culture, textiles are one of the most easily lost to time. As such it is intriguing that the Chancay culture came to be known best for their remarkable textiles in both antiquity and modernity. Their numerous techniques made use of materials from both plants and animals, chiefly cotton and the wool of camelids of the region. From embroidery to open-work weave fabrics their masterful textiles are known in today thanks to the arid environment of the central Peruvian deserts that helped preserve the intricate threads and dyes. 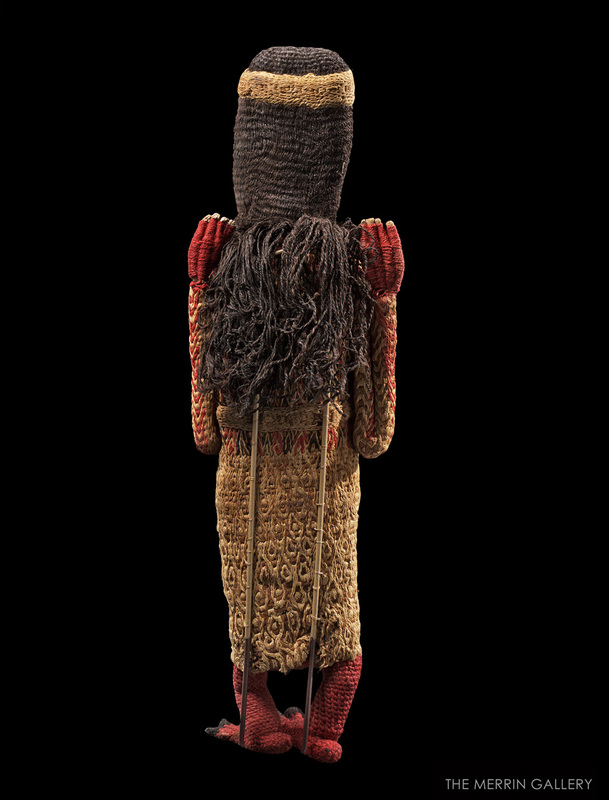 Figures made of textile material, also known as “dolls”, are usually recovered from funerary contexts. It is unknown whether they were meant to be seen as toys, as a representation of the person as they were in life, or even in the same manner as Egyptian ushabtis; servants for the dead in the afterlife. Made of wool from the domesticated llama, guanaco, or wild vicuña and stuffed with reeds, this pair was undoubtedly found in such context to be in such fine condition. 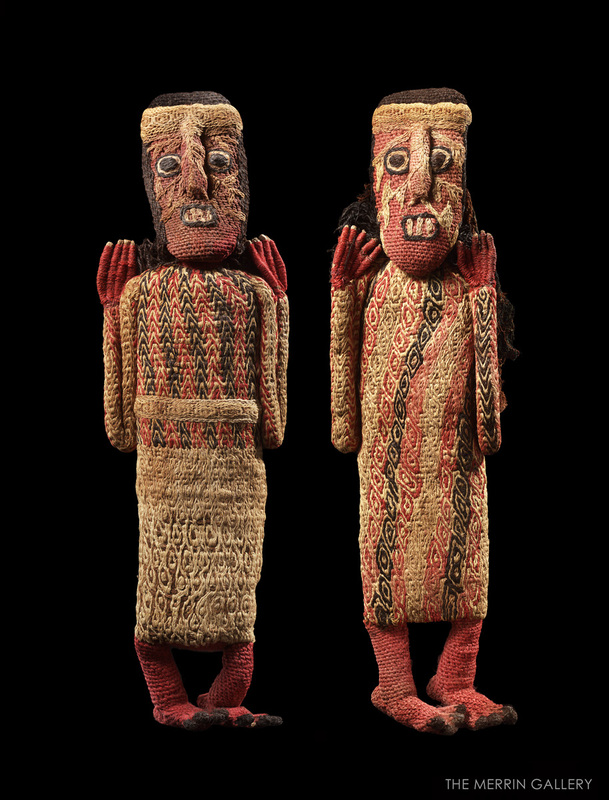 Although these figures are of the same type they are by no means identical; subtle differences range from the markings embroidered on their faces to the styles of their attire. Alternating vertical bars of black and red with yellow zigzag stitching form the primary design on the upper piece of Figure A, with the zigzag motif continuing along both arms. 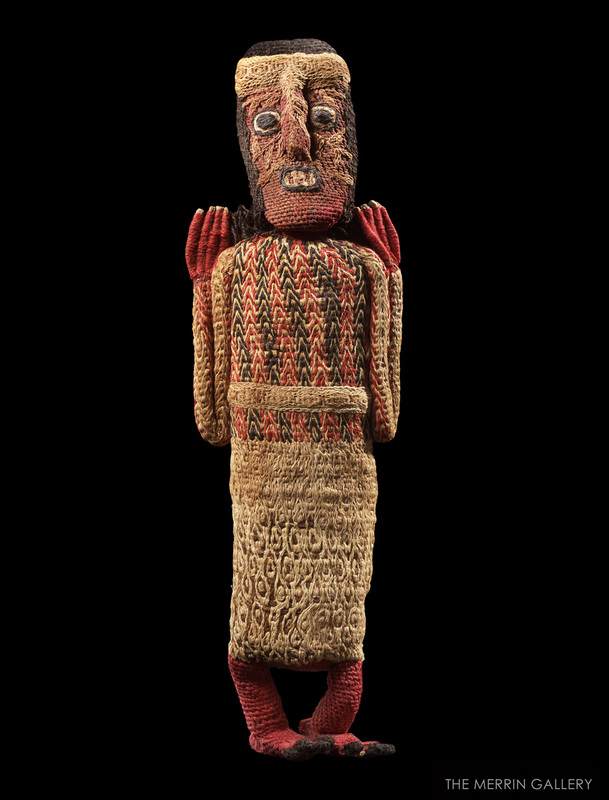 This figure wears a two-piece garment separated by an intricate yellow belt. From just below this the skirt begins with tightly packed ovoid patterns that spread out and become more distinct until the garment ends at the calf. Figure B has a more uniform dress-like design that alternates between red, yellow, and black beneath yellow stitched concentric ovals that extend to the arms. An open-work cloak sits across the back of the shoulders. 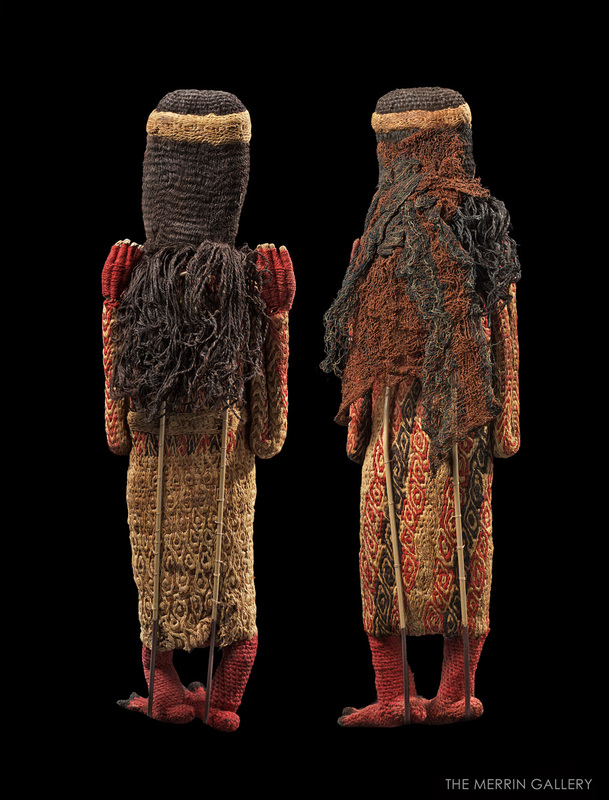 Both figures have long brown hair made of expertly twisted yarn that falls to mid-back bound by headbands that wrap across the forehead. On both dolls the digits are composed of the same red cloth that make the legs, feet, and faces. The feet of both figures are quite realistic, with a heel and separated toes capped by a dark color that is likely meant to simulate nails. The wrapped cloth of the fingers, on the other hand, allow tightly packed dried grasses to peak out of the tips as finely formed fingernails. 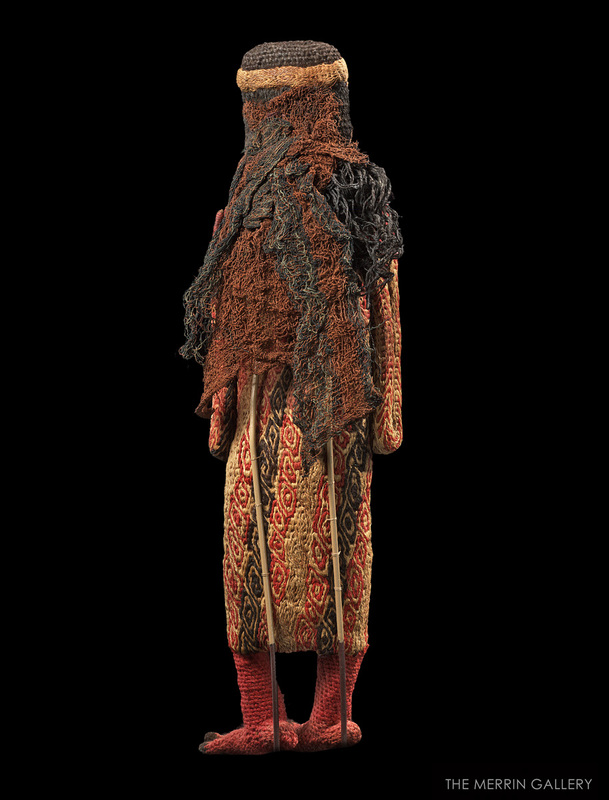 Beneath the short edge of the skirt the body is capped by a red textile bottom, and the arms were made separately before being attached onto the shoulders. Ethno-historical research shows that it is highly probable that the pigments used to dye these figures were made using the same techniques found in traditional methods today. The bark of the false pepper tree provides a recognizable yellow hue, while the cochineal insect combined with various mordant types is responsible for red and black. Contemporary dolls made out of textiles salvaged from grave sites and embroidered with modern thread are sometimes sold to tourists today. Nobody knows what their purpose was a thousand years ago, but today they are a way for the people of Peru to maintain a connection to their heritage and culture.